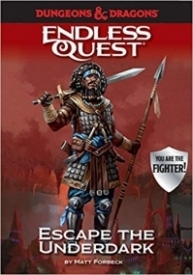 Welcome to the Forgotten Realms Endless Quest books, where you don’t just read a fantastic tale. You become the hero — and choose your own fate. You awaken in an underground cell, stripped of your armor and your sword. Your fellow prisoners inform you that you’re trapped in the Underdark, soon to be taken to the great drowcity of Menzoberranzan and sold off as a slave. But word is that demons are stirring in the underworld’s depth. Perhaps you can use that to break free, fighter.